Knitting With a "Y": The Accounts of a Male Knitter: Progress? 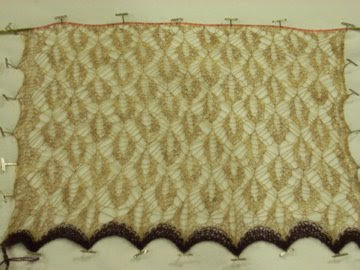 This shawl is taking forever to knit up. What you see there is 1/8 of the body, which has sadly taken me about 5 months to complete (including swatching and multiple false starts). The pattern itself isn't super hard, but the combination of the stiff, skinny yarn, detailed pattern (this is not social knitting), and my lack of free time all contribute to slow goings on this one. I hope I can get going a little faster to finish this one up - it's about time. I'm heading off to Chicago tomorrow (today, in about 5 hours) with my school's Wind Ensemble and although I will be spending most of the weekend performing at various venues, I will have most of Saturday all to myself downtown, which means: yarn exploration! I'll let you all know how it goes, and I can confidently say that I will have an FO to show you (I know this because I accidentally knit half of it tonight while doing laundry, even though I only intended to cast-on in preparation for travel knitting). Even though it's slow going, it looks wonderful!! I can't wait to see what your knitting now. Hopefully you have a great trip with wonderful yarn shopping!! Hey--that shawl looks better than you make it sound. Have fun in Chicago!